With social media, AdWords, email and so many other channels to reach potential and existing clients, why do businesses large and small STILL bank on branded merchandise and apparel for their marketing success? Simply put, it works! With a low cost-per-touch, off-the-chart recall, and lasting presence, branded merchandise and apparel provide value like never before. Smart marketers know to leverage promotional items as part of their overall marketing plan. Tyler Hager, co-owner of CharBar No. 7, continues to grow his business and relies on The Dunstan Group to deliver the goods that get him noticed. 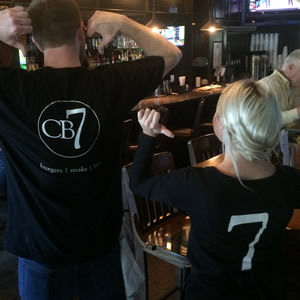 Right now, he’s busy opening two new CB7 locations in Asheville and Pinehurst, NC. Hager says branded merchandise plays a “huge role” in their marketing. CharBar No. 7 puts its logo on pens, hats, koozies, tees and sweatshirts from The Dunstan Group. And Hager says he’s always on the lookout for ways to get the word out and raise the profile of his brand. The restaurant business is a people business. Working with people and customers is what Hager likes best. Whether it’s interacting with guests in the restaurants or working behind the scenes as they set up new locations, Hagar aims to strike that balance between the dining room and the board room. Hager isn’t new to the restaurant business. His father and cousin operate Hickory Tavern, which started in Hickory, North Carolina. With CharBar No. 7, Hager and his sister are in the mix. Working so closely with family, relationships matter just as much to Hager on the business side of the operation. Clearly, that strategy is working. Founded in 2011, CharBar No. 7 is set to open up its fourth and fifth locations soon. Well done! Looking for ways to make a lasting impression with your marketing dollars? There’s a place for branded merchandise and promotional product in your success story, too. Contact The Dunstan Group and let us help you write yours!